In one of the several really fun petting tanks at Georgia Aquarium live Fish-eating anemone, with colorful starfish as cohabitants. Why pet a creature that eats fish, you ask? Fortunately for us, the venom the anemone use to capture its food is not poisonous to humans...so, pet away! The Fish-eating anemone calls the coastal waters from Alaska to southern California home. They can grow up to eight inches tall and up to 10 inches in diameter. They also have the ability to move...should their food supply become diminished, for example. 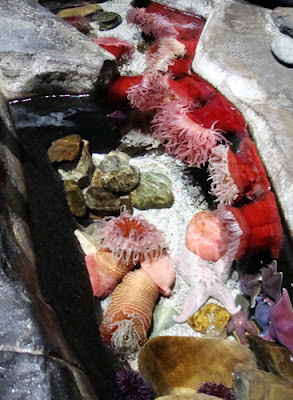 As with the other petting tanks at the Aquarium, remember to pet the anemone with only two-fingers and always be gentle. The tank is on the right immediately inside the Cold Water Quest gallery.